There will inevitable be times in each of our lives when we are faced with difficult decisions that alter our course for better or worse. We may have to decide between the comfort of staying in a longterm relationship even though it is causing us pain, or we may be faced with the decision of staying in a stressful job that brings substantial material wealth. We may have to decide to give up a detrimental health habit which means losing close friends, or we may face the decision of confronting someone who has done something wrong even though it puts us in danger. At the end of the day, it will be these types of decisions that determine how happy we are with how we have lived our lives. For this reason, we have to develop the strength, flexibility, and courage to make the right choices in challenging times. To handle the inevitable life altering decisions that we will face, we need to make sure that our decision-making muscle is strong. Fortunately, just as one ventures into the gym to build their physical strength, we can do the same to build our decision-making prowess. By creating and facing daily decisions that cause internal and external resistance head on, we can reach a place where freedom of choice is ours. By making the commitment each day to do something that is beneficial and challenging for ourselves, we can build our decision-making muscle. In the simplest of terms, decision-making can be defined as the act of choosing one course of action, or one singular belief, over a variety of other viable options. The decision-making process, however, is much more complex than this simplified definition and an individual’s small and large decisions are both similarly affected by a multitude of variables. There are a variety of psychological models that lay out a number of useful steps that we can follow when we are making life-altering decisions, but it would be impossible to make every choice using such a system. Still by analyzing one such model, we can improve our understanding of the decision-making process which will help us formulate a plan for building our decision-making muscle. The University of Massachusetts Dartmouth has created a decision-making model that shows how individuals can make better decisions by organizing relevant information and carefully weighing their options. The model lays out seven distinctive steps and closely resembles the oftentimes unconscious process that humans use to make decisions. The model tells us that after identifying a decision that needs to be made, an individual should gather information, identify alternatives, weigh the evidence, choose the best option, and take action before reviewing the decision after some time has passed. While this decision-making model can be a useful tool for an individual who is faced with a difficult decision, it doesn’t take into account the numerous variables that complicate our abilities to freely choose our best options. 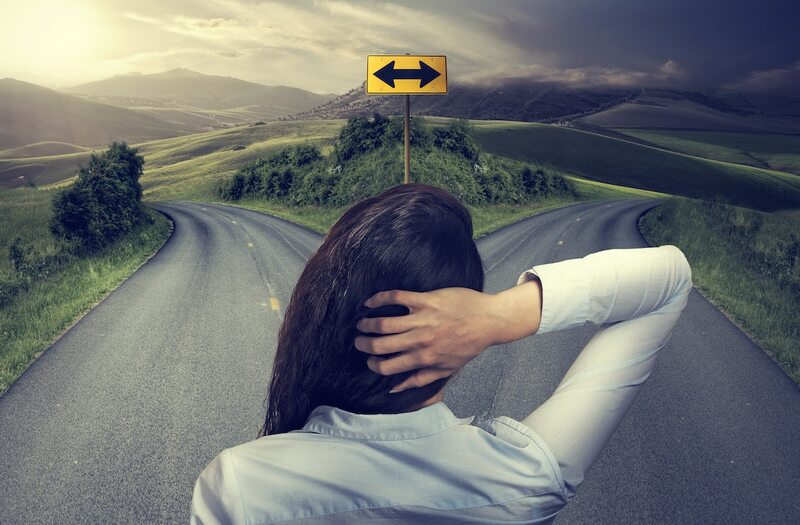 As you will learn, making small and large decisions alike can be challenging because there are a number of psychological, environmental, and biological factors that affect the decision-making process, oftentimes out of our conscious awareness. Reasoning & Intuition: When faced with challenging decisions, there will inevitably be times when our intuition tells us to choose an option that differs from a more logical choice. We can easily become incongruent, potentially not making any decision at all, when our brain uses sound reasoning to sway us away from acting on our most heartfelt option. While no two situations or decisions are exactly the same, it is our belief that following your intuition usually puts you in the best position to make the most life-affirming choices. Past Experiences: The memories that we store in our brain play a major role in the decision-making process. Based upon our experiential history, we have a base of information that we use, oftentimes unknowingly, to help us make big and small decisions alike. Unfortunately, in the grand scheme of things, our experiential reference base is greatly limited and keep us blinded to potentially better decisional alternatives. On top of this truth, past experiences naturally lead to conditioned habits and the decision-making process becomes practically automatic. Cognitive Biases: The term cognitive bias is used to describe an error in thinking that affects an individual’s decision-making and judgment. Psychologists will tell you that there are over 100 cognitive biases that can potentially limit the decision-making abilities of an individual. For example, subjective validation is when someone holds the perception that something is absolutely true if a subject’s belief demands it to be, pessimism bias is when an individual overestimates the probability of negative things happening to them, and the ostrich effect is when an individual ignores an obvious problematic situation. Emotions & Fear: There are a range of biological factors that also play a part in the decision-making process. In particular, an individual’s emotions and fears can especially lead to faulty decision-making. When individuals are in emotionally charged states, they often make decisions that they wouldn’t make with a level head. The natural biological flight-or-fight mechanism helped keep cavemen save, but can cause us to overanalyze a perceived threat and make decisions that aren’t truly life supporting. A behavior that gives us short-term benefit/pleasure but produces a painful/negative outcome (Overindulging in a meal to a point where you become sick). A behavior that gives us short-term benefit/pleasure and produces a beneficial/positive outcome (Spending a weekend having fun with your kids). A behavior that is painful/negative and produces a painful/negative outcome (Staying in a toxic relationship knowing that it won’t get better). A behavior that is painful/negative but produces a positive/beneficial outcome (Sticking to a work out plan). In particular two of these behavioral types can act as our tools for building our decision-making muscle. By purposefully creating resistance with behaviors that give us short-term pleasure but produce a negative outcome and behaviors that give us short-term pain but produce a positive outcome, we can begin to tone the muscle of decision-making. Without question, there are a variety of strategies that we can use to build our decision-making muscle and intrun make ourselves better people. It would be nearly impossible to find an individual who doesn’t have a particular vice or habit that they would like to change. To build your decision-making prowess, it will be important to pinpoint a number of behavioral habits that you would like to modify. You can use resistance to build your decision-making muscle by working to overcome behaviors that bring us immediately pleasure but have negative consequences, or you can use determination to improve your decision-making abilities by forcing yourself to partake in painful activities that produce beneficial outcomes. Let’s look at a few examples the can help you determine particular behaviors that can be used as ‘decision-making weights’. Reading in favor of watching T.V. To build your decision-making muscle, you will first need to determine one or two daily behaviors that cause resistance and force you to make a decision. Once you have your ‘decision-making weights,’ you will have to make the commitment to follow through on one small activity every single day. As you go through this process, it will be important to discover how previously unconscious internal self-talk oftentimes leaves you with little say in the decision-making process. By making the commitment to follow these guidelines for three months in a row, you will certainly build your decision-making muscle. Once you have improved your initial decision-making strengths, you can then move on to more challenging obstacles. It is important to remember that just as a weightlifter loses strength after they quit working out, you also will lose your decision-making prowess unless you invest your time into its development.